OK, Let me let you in on a little secret. I LOVE L'Oreal products! In my opinion they're probably the best drugstore brand out there. As a matter of fact it's always been a big debate on whether or not Lancome and L'Oreal use the same products but different packaging (FYI: L'Oreal owns Lancome) Anyway that debate is for a different time and place. 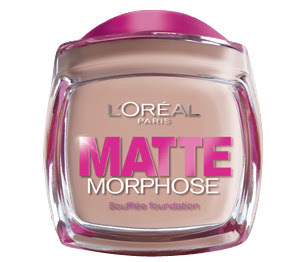 I want to talk about L'Oreal's NEW Matte Morphose Foundation. Now, L'Oreal's Matte Morphose Foundation is only available in the UK for now so don't go running to the store just yet. The consistency is similar to Maybelline's (which L'Oreal owns too) mousse foundation but is different because it's a silicone based which means it contains no talc and creates an almost flawless finish. "L'Oréal Paris Matte Morphose achieves a matte, luminous finish for up to 12 hours. The feather-light soufflé foundation extends effortlessly across the skin with the lightest touch. Imperfections, fine lines and pores appear reduced. Skin feels peachy-soft and looks transformed."